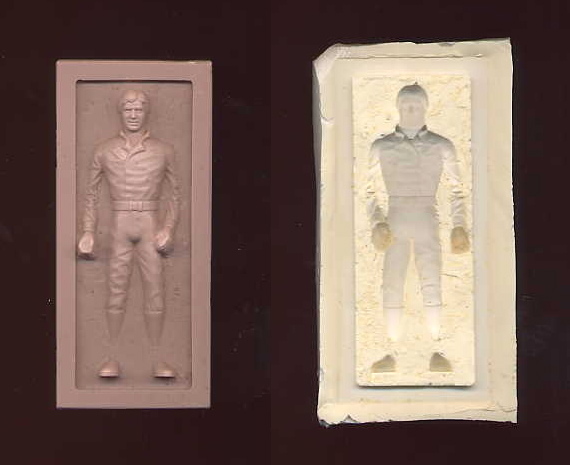 These are two prototypes of an early design for the Han Carbonite figure which was ultimately changed. When the figure was first considered for the Power of the Force line in 1985, Han was suppose to pop out from the front of the carbonite slab. The piece on the left is a wax casting of the front of this proposed figure design and the item on the right is a silicone mold for this casting. Had this figure moved forward in the production process, a hardcopy would have been made using the silicone mold. These pieces were obtained from a former Kenner sculptor who gave the background on this previously unknown figure concept for Han Carbonite.